When last did you consider how much of your subscriber base is inactive and unresponsive? If you were to take an honest look at your database in terms of deliverability and interactivity across campaigns, how serious is this issue? This month, eMarketing Insight looks at how you can effectively re-engage inactive and unresponsive subscribers with reactivation campaigns. It’s quite shocking to think that as much as 90% of your database could be dead wood. Inactivity costs you money and muddies the waters when trying to measure the effectiveness of your campaigns. Perform CPR or flick the switch? Inactive and unresponsive subscribers cost you and may harm your deliverability rates, but is it the right strategy to remove them from your database? Ideally, you should first try to restore the lost relationship through reactivation campaigns and methods – this way you can attempt to elicit responses and ultimately re-introduce subscribers to your brand. If you are still left with unresponsive subscribers, then cull these addresses from your email database before they cause deliverability issues for you. Dormancy is of course only one side of the coin. Measure the campaign analytics in terms of actual purchases, regardless of channel. Some customers may never open or click on a campaign, yet they make a purchase in-store or online. 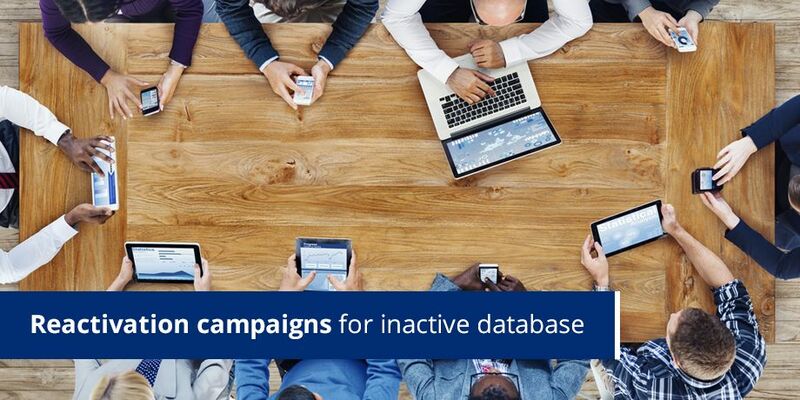 Reactivation campaigns should therefore be run according to customer activity e.g. no interaction with your brand through any channels for three months. This approach needs to be tailored to your company and how you measure customer engagement – whether as open and click-throughs, purchases or both. When you notice your open and click-through-rates dipping, it’s time to employ some tactics to encourage your customers to re-engage. Incentivize: some customers may be bribed ‘back to life’ with a once-off incentive. But beware as you run the risk of encouraging the wrong future behavior – customers may continue to wait for ‘never to be missed offers’ before they engage again. Weigh up the revenue reward and risk to see if this approach is right for you. Subscribe down: Less frequent and more targeted communication may be what your disengaged customer needs in order to bring them back from inertia. Education: Your customers may need to be reminded of your offer – what’s in it for them as a subscriber, and how can they access it? Survey: Ask your customers what they like and dislike about your campaigns, products and services. Understand where the problem lies and use this feedback to address these problems. Reactivation campaigns never promise a full return on your investment. However, you will increase your success by employing a regular ongoing reactivation program to address email churn and disengagement of subscribers. In other words, apply proactive methodology as opposed to desperately trying to win back a subscriber after years of disengagement.